At Christmas, no home’s complete without the perfect set of Christmas lights, which is why they’re always at the top of our buying list when we start to decorate the home for the festive period. However, with so many to choose from it’s sometimes difficult to know where to start. So, to help you make that all-important decision, we’ve put together this Christmas lights buying guide, so you won’t be left in the dark when it comes to choosing yours this year! The colour of your Christmas lights will depend entirely on the look you’re going for. 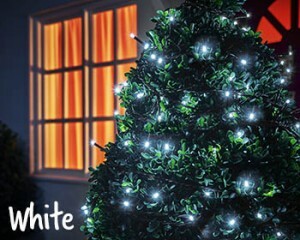 If you’re after a traditional, welcoming feel then warm white or white Christmas lights are just the job. Alternatively, if you’re wanting something a little different and contemporary, multi-coloured or red are ideal. However, you can still add unique touches to your tree even if you do opt for white lights – just choose standout decorations, like those in our Starry Night collection. 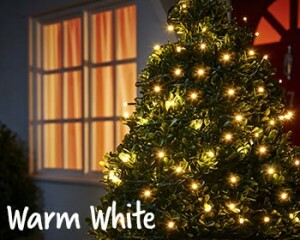 Standard fairy lights are ideal for Christmas trees. 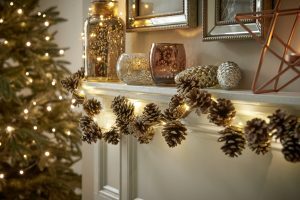 However, if they’re being draped over a banister, placed on the mantelpiece or put up in the window then there are lots of alternative bulb shapes you could consider, including pine cones, stars and snowflakes. y into your Christmas tree, whereas a discreet, clear cable would look great when decorating a mirror or picture. Before you buy your Christmas lights, decide where they’re going to be placed because this will determine how many you need to buy. It’s a good idea to measure up first so you don’t fall short. A window dressed with lights will, of course, need a much shorter length than a 6ft Christmas tree! If you don’t want to be burdened with trailing cables across your living room, battery-operated lights are ideal. With these sets, you’ll only need a maximum of 3 AA batteries so they’re great for on-the-go glow! 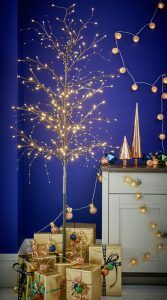 If you fancy a break from traditional fairy lights this year, why not light up your home with a gorgeous pre-lit twig tree? Not only do they inject a touch of style into your room as soon as you put them up, but they also boast a contemporary edge that brings a unique twist to your Christmas decorations. Alternatively, why not place one in your hallway or another room to bring further festive fun to your home. Now you’ve chosen the perfect Christmas lights for your home, it’s time to consider those all-important essentials that’ll enhance your lights. Firstly, it’s a good idea to plug your lights into a timer switch so they’re only set to come on for a few hours a day when you’re in the house, thus saving you from a hefty electric bill. Some of our Christmas lights already come with a built-in timer function. If you’ve chosen mains-powered lights, be sure to check they reach a plug, otherwise, you’ll need an extension lead. 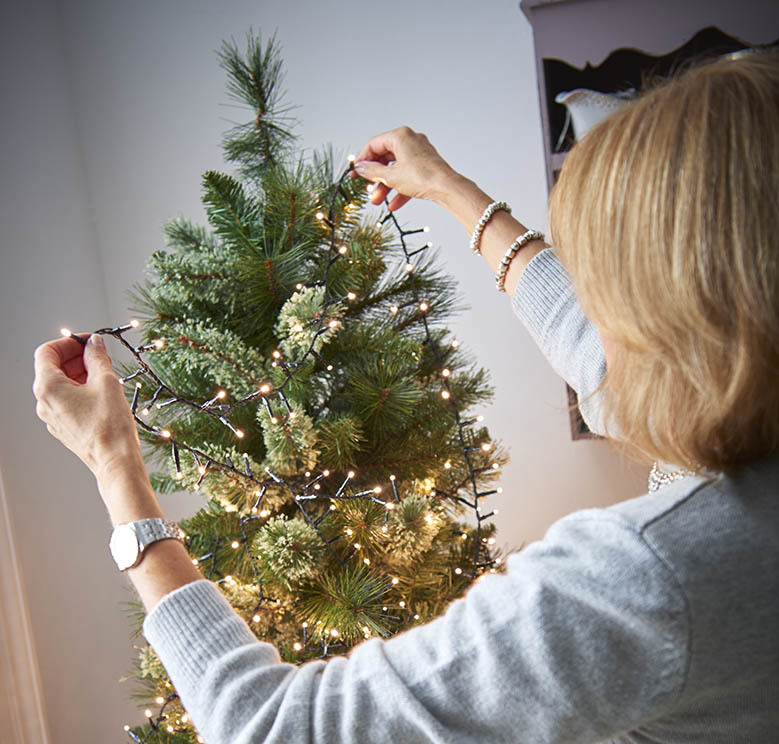 After all, there’s nothing worse than going to plug your lights in when you’ve decorated your tree to find the plug won’t reach! Finally, when you’re putting Christmas lights up around the home (e.g. around the window or along the stairway), remove the need for messy tack or adhesive tape by using some hanging hooks. Safety first: Always keep lights out of reach of small children and pets. Make sure you’re buying lights intended for indoor use only. All our packaging will tell you whether they’re suitable for indoor use, outdoor use or both. Looking for some inspiration when decorating the outside of your home? Take a look at our Outdoor Christmas Lights blog here. Shop our full Christmas lights range online at wilko.com, and don’t forget to light up our Facebook, Twitter and Instagram pages with your decorations once they’re up!